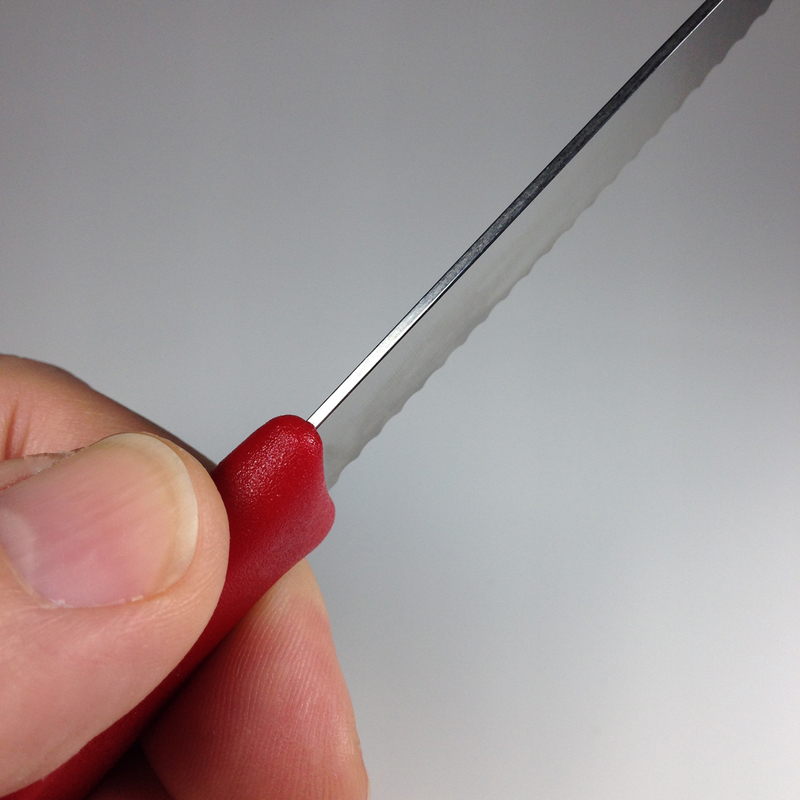 Little Vicky is a utility knife perfect for food prep. When you need to cut salami, cheese, fruit, or spread peanut butter or humus, Little Vicky is a champ. Why struggle with a tiny knife? It’s so light and functional that you’ll be inclined to pack more fresh food for your hikes. Plus it opens packages and cuts cordage with ease. The blade is made from X55CrMo14 high-carbon stainless steel (56 HRC) for a good balance of edge retention and corrosion resistance. It’s a paring shape, flat ground blade with an ultra-sharp serrated edge grind. It stays sharp because the serrations shield the edge from damage. The polypropylene handle is easy to grip and has a slip-resistant, textured surface. A polypropylene sheath provides protection for the blade when not in use. It helps keep the blade sharp while also protecting your gear from damage and keeping your fingers in one piece. The knife is dishwasher safe. Very sharp blade and tip. 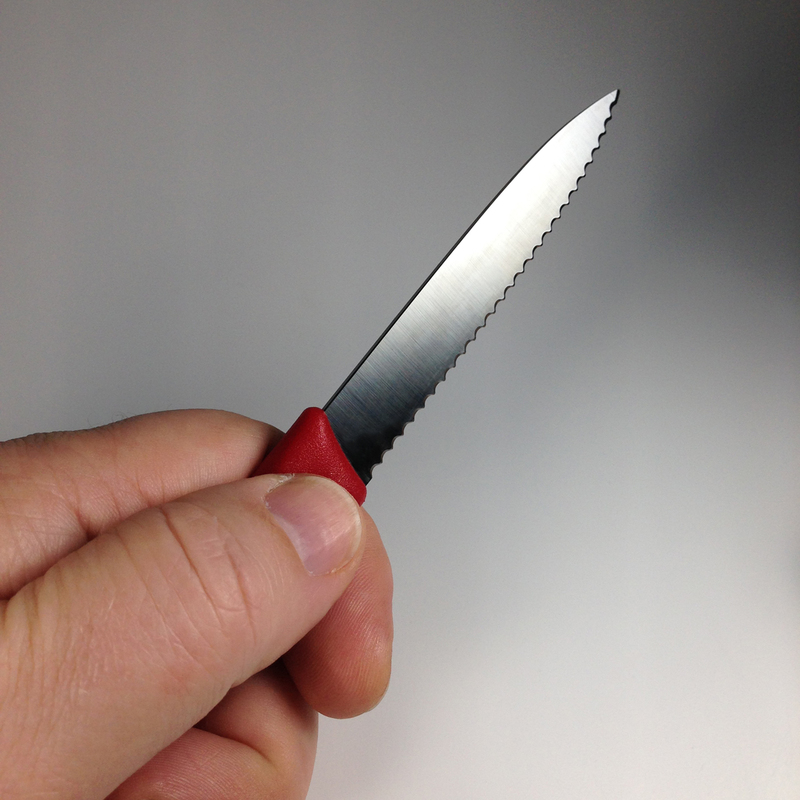 To avoid possible injury, point blade and tip away from you and others and use with caution when handling. Keep in sheath when not in use. I found the knife very sharp. No trouble slicing bread. It is also light weight. The spine of the knife also works with my fero rod. NICE! victorinox is an excellent manufacturer with decades of quality. I have one of these knives in the kitchen and I use it everyday. The sheath makes it great for camping. It's light and sharp.